Ready Now- No Storm Issues! 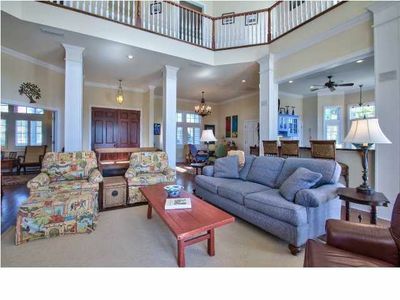 Popular, private Plantation retreat! 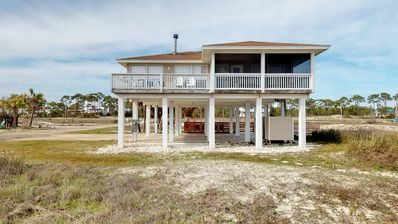 Screened Porch, Fireplace, Wi-Fi, 4BR/3BA "Morningside By The Sea"
GREAT HOUSE, GREAT ISLAND, GREAT PRICE...GREAT VACATION! 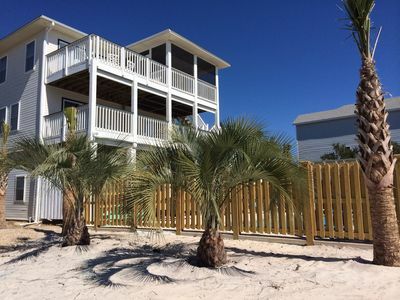 ST GEORGE ISLAND...AMERICA'S 3d BEST BEACH FOR 2014!!! 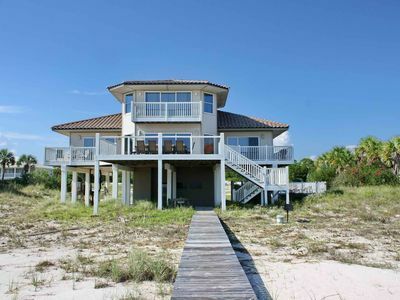 Welcome to MORNINGSIDE BY THE SEA, sited on a lot filled with natural indigenous vegetation in St. George Plantation. 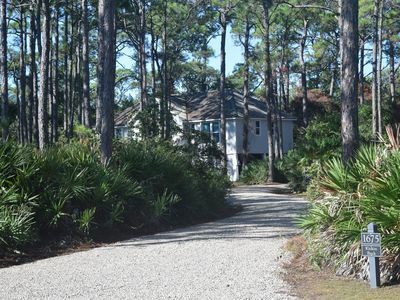 Our beautiful beach is a short, 2-minute stroll along a sandy wooded path with no streets to cross. Our home is comfortably furnished with one king, two queens, two twins, and one double convertible bed. 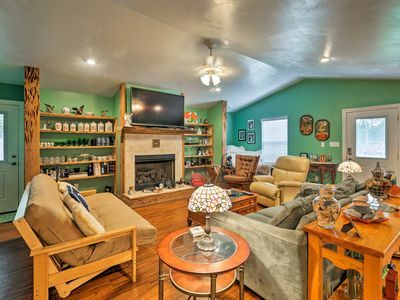 You will find a real 'home away from home,' with informal, comfortable furnishings, interesting art and artifacts, and a very well-equipped kitchen. 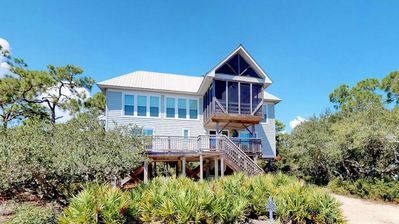 An open vaulted-ceilinged kitchen/dining/living area (with fireplace), one bedroom/bath are on the second floor, to take advantage of the Gulf views. This level also has a screened porch for alfresco dining and 'rockin.' The lower level has three additional bedrooms and 2 baths. 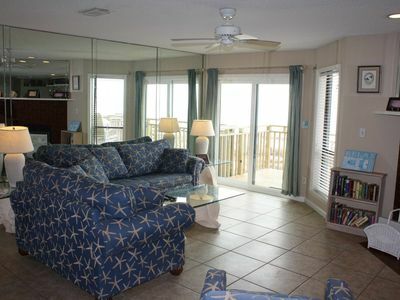 A large sundeck with reclining lounge chairs may be accessed from two of the bedrooms. All bedrooms are carpeted, while the living areas have heart pine floors. Guests will find 2 TVs, 2 DVD players, wireless internet, free long distance calling, and a CD player/radio. Guests are welcome to enjoy the games, puzzles and books in the home. Morningside by the Sea is architect-designed to capture cross breezes for fresh air living and sleeping in mild weather. 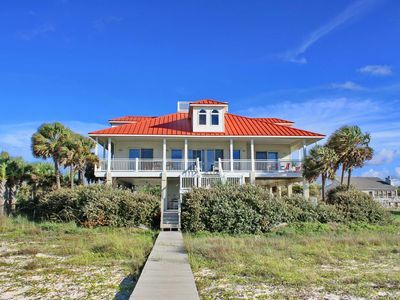 St. George is a peaceful and beautiful barrier island off Apalachicola, Florida. On the north is Apalachicola Bay (famous for oysters). To the south is the Gulf of Mexico. 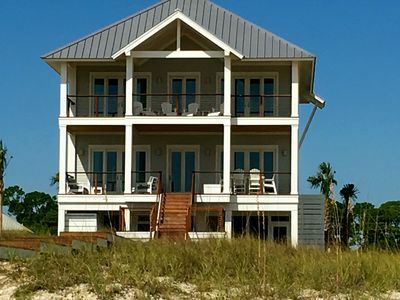 This is an area very much into eco-ventures, with several local companies providing escorted and self-guided tours into the Apalachicola River/Bay estuary. The Gulf, river and bay offer great boating and fishing opportunities, with local charter companies available to help you plan and achieve your adventure. St. George Plantation has a pool and tennis courts, usually available to guests. Our uncrowded beach speaks for itself. The sand is white, the water is bottle blue/green, and the shells are (usually) plentiful. The birds, dolphins and ghost crabs are free! Morningside by the Sea was built in 1991. We think of it as a family home rather than merely an investment. It is used by us and our kids for more than 16 weeks a year. We hope think you will enjoy Morningside as much as we do and fully expect you will soon love this island as much as we do. If you are looking for water slides, amusement piers. goofy golf and high rise living, this is not for you. If you consider vacation a time to enjoy life, family and nature while doing next to nothing then St George is the place to be. Don't fail to visit St. George State Park at the opposite end of the island. 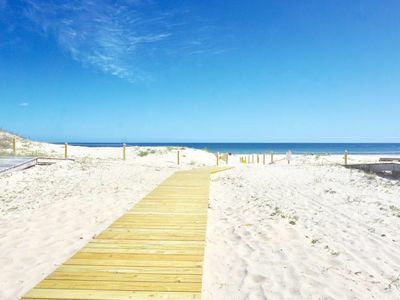 Here you will find dramatic moonscape dunes, secluded beaches and scenic hiking trails. The East Slough Trail can be accessed from the first large picnic shelter area...cross to the north side of the road and follow the wooden walk. Take bug spray! Trail meanders about 1.4 miles through uplands and along and over marshes. at the end you pass through a camping area with 2 small lakes...look for the gators on the far bank. Return to your car by walking the trail in reverse or by walking west on the beach. 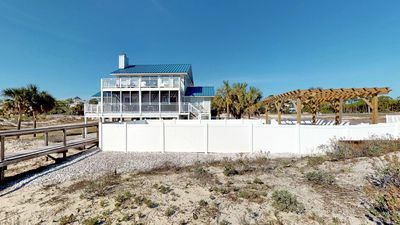 The lighthouse in the middle of the island was recently relocated and rebuilt following its 2005 collapse at its original location since 1853 on Little St. George Island to the west. A community effort salvaged the brick and much of the lantern frame. In 2008 it was rebuilt using the original construction plans. Pay a small fee and climb to the top for a great view. Visit the replica of the keepers cottage / museum / gift shop at no charge. ANERR is in East Point near the mainland end of the bridge from the island. Learn what happens when salt and fresh water meet. No charge but contributions appreciated. Museum, small aquarium and touch tanks. Kids love it! Also pick up information on the ANERR access areas on the island and mainland where you can hike, bird-watch and get great photos. This 4 mile easy trail has its east trailhead on the north side of US 98 about 8 miles east of East Point. Nice trail in good weather (don't try in wet weather unless you want to wade in real scary water). Nice views of sound and marshes. Beautiful wild flowers in season. Take bug spray! Be sure to find out the origin of the name 'Tate's Hell' from the locals. This beautiful and historic little town is across two bridges from the island (about 12 miles). Many preserved Victorian and Greek Revival buildings, great restaurants and interesting shops. See the 1907 Gibson Inn Hotel, 1838 Trinity church, Lafayette Park, Maritime Museum and the trail to the river from the parking area at the original ANERR location near Scipio Creek Boat Basin. 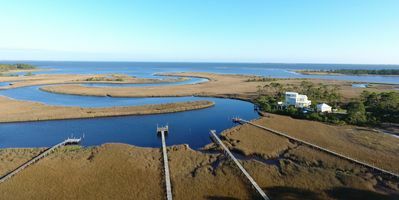 Also at Scipio Creek is the headquarters St Vincent Island Nat'l Wildlife Refuge where you can obtain passes to visit this undeveloped island. A bit of trivia... in the 1850's local doctor John Gorrie tried to develop a machine to cool his patients habitually suffering from malaria every summer. His machine was a failure as an air conditioner but very successful at making ice - moisture froze on the coils. Today he is credited with inventing artificial ice production...Thank you Dr Gorrie!! See the small museum dedicated to him and his accomplishment. On route 30 about 10 miles west of Apalach, this is more an institution than a restaurant. In business in the same building for over 80 years. Old time laid back place. I once arrived at 11:30 for lunch and found it closed. I asked the old man sitting on the bench out front if they would be opening. 'Yep, reckin so.' 'When?' 'Well, when they git here. '...My kind of place! Located on US-98 about 12 miles east of East Point. In the 40's Camp Gordon Johnson near this small town was a major beach assault training center for the US military. Many of the veterans of the Normandy landings trained on the beaches of St George and Dog Islands. Today there is a WW-II museum in town. This is also a big boating and fishing center. Ready now - No storm issues! FREE BEACH GEAR! 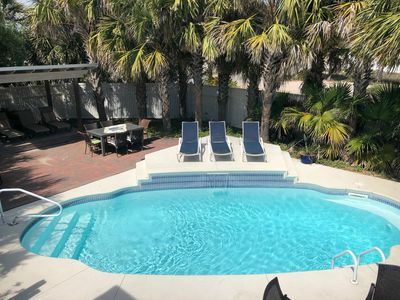 Beachfront East End, Pets OK, Community Pool, 2BR/2BA "Ocean Mile I-3"
Ready After Hurricane Michael! FREE BEACH GEAR! East End, Pets OK, Pool, Screened Porch. 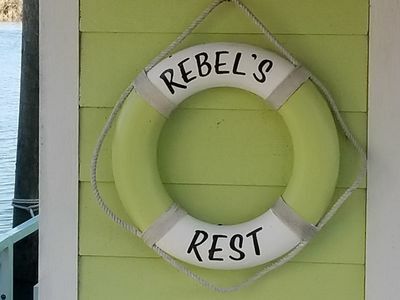 Wi-Fi, 4BR/4BA "Being Shellfish"
Ready to rent now! FREE BEACH GEAR! 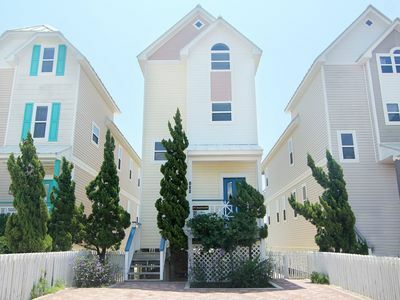 Beachfront, Pets, Hot Tub, Fireplace, Private Boardwalk, 4BR/4BA "See Escape"
Beachfront! 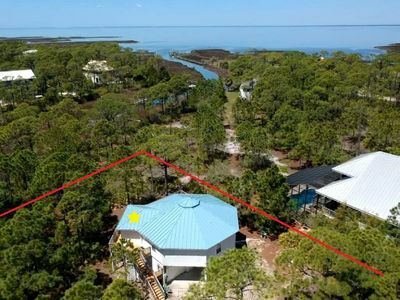 Awesome home, Gorgeous Views, Dog Friendly, Walk Everywhere. Ready after Hurricane Michael! FREE BEACH GEAR! 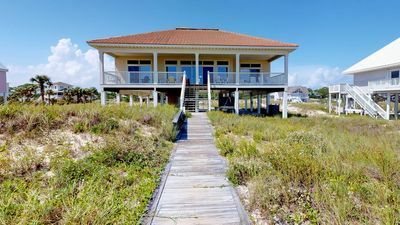 Beachfront, East End, Private Boardwalk, Fireplace, 4BR/4BA "Seaduction"
Ready After Hurricane Michael! FREE BEACH GEAR! 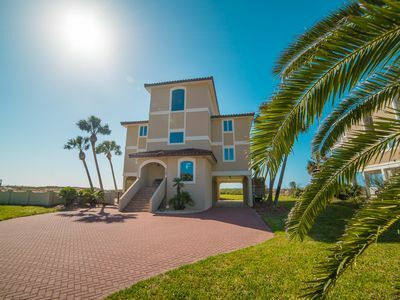 Beachfront, Pets OK, Pool, Private Boardwalk, Wi-Fi, 4BR/4BA "Soulshine"
Ready Now- No Storm Issues! FREE BEACH GEAR! 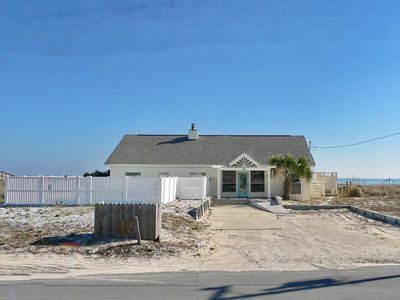 East End Beach View, Pets, Pool, Screen Porch, 3BR/2BA "In Turtle Time"
Be close to everything on the Island! Cute and Cozy! 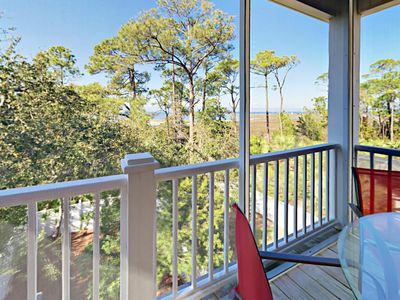 Screened Porch with easy beach access! Community Pool!